Regular tournament attendees will be familiar with the sight of T Mark Hall sitting in a corner with his laptop, demonstrating and hoping to sell GoGoD (Games of Go on Disc). Many's the time I've walked past. Last updated Tue Jan 21 2014. If you have any comments, please email the webmaster on web-master AT britgo DOT org. Last updated Fri May 06 2011. If you have any comments, please email the webmaster on web-master AT britgo DOT org. MyGoFriend is a strong program for Windows with some interesting features for studying, at least in 9x9. As fits the gold medallist from the 2010 Computer Olympiad it is powerful, but limited in some ways and lacking some features which may be considered basic in other programs. It has 7 pre-programmed levels of strength, beginner to sensei, which search through a certain number of game trees. This means the strength should be the same across different computers, although more powerful hardware will move more quickly. The first 3 levels are very weak, regularly missing ladders. I found the 4th and 5th levels (club player and expert) gave a good game (I am 1 kyu, but much more used to 19x19 than 9x9), while 6th level was tough if it had komi and took about 20 seconds for the first few moves, then speeding up. The sensei level thought for so long I got bored. Last updated Mon Feb 23 2015. If you have any comments, please email the webmaster on web-master AT britgo DOT org. The article has its origins in a conversation with Gerry Mills, our esteemed Bookseller, one night at the Chester Go Club. Gerry asked us if we thought the future for books lay with ebooks rather than with traditional paper copy. In the old days mighty tomes would arrive on a reviewer’s desk with a ‘thwump’. GoGoD, a massive database of over thirty thousand professional games, plus additional material and go utility programs, comes on one CD. 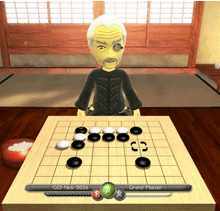 The Many Faces of Go Joseki Base is a very useful piece of software for the PDA created by David Fotland. It contains josekis for corner positions starting from the 5-5 to 3-3 points and has a very thorough set of variations. Last updated Fri Feb 18 2011. If you have any comments, please email the webmaster on web-master AT britgo DOT org. My first impression of SmartGo was of a bewildering range of options, so that I didn’t know where to start. I discovered later that there were even more toolbars that are initially hidden. Most of them relate to diagramming, annotation, editing and maintaining a library of game records, and these are SmartGo’s strengths. Simply playing Go against it is to ignore its best capabilities. The facilities to annotate games, create diagrams, compose problems and to make a library of games are extensive. With the optional library of 27,000 professional games you have the opportunity to study fuseki and joseki, including the interesting statistics of how frequently a particular move has led to victory or defeat. Rather than describe the tools in detail I suggest you download the SmartGo:Viewer from www.smartgo.com and see for yourself. Last updated Wed Jan 27 2016. If you have any comments, please email the webmaster on web-master AT britgo DOT org. It has a limited understanding of the rules of play. It automatically removes strings that have no liberties, but it does not know about the ko rule, and it does not allow suicide. The concept of "sector lines" was invented by Wilcox in the 1970s when he began working on computer Go, and described in his 1993 book "Instant Go Volume 1". To quote from the program: "A sector line is an imaginary line running between two stones of the same color, anywhere on the board.